I remember when there wasn’t a day that went by that I didn’t eat cheese. I’d suffer from tummy pains, eczema, and wobbly bits on my body where I didn’t want them, but still I wouldn’t step away from the cheese. Thankfully I finally got savvy, but I do miss the fun of cheese sometimes. I’m not brave enough to attempt making one of those complicated cultured vegan cheeses yet (one day! ), but thankfully this one is a cinch to make and still made me feel all clever in manner of Professional Cheesemaker. It doesn’t taste like the creamy, Danish feta I once loved but it does taste like the traditional hard, crumbly feta in brine. Sprinkle it with balsamic vinegar and wait for the magic to happen! 1. Add all ingredients to a medium saucepan. 2. Bring to the boil, reduce heat and simmer uncovered for 30 minutes. 4. 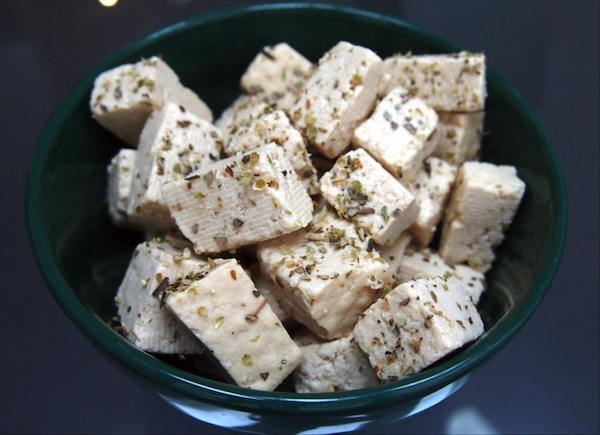 Place tofu and brine into an air-tight container in the fridge overnight. The longer you leave it, the better it gets. 5. Drain immediately before use. Any unused portions can stay refrigerated in the brine for up to 2 weeks. Thanks, I will try. It does look easy. Thank you Rebecca for the recipe and especially thank you to Joseph B for an excellent comment! Thank you Rebecca. This sounds interesting and easy to make. 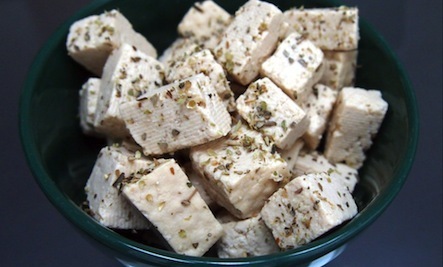 Many thanks,ill try-tofu can b desperately boring!